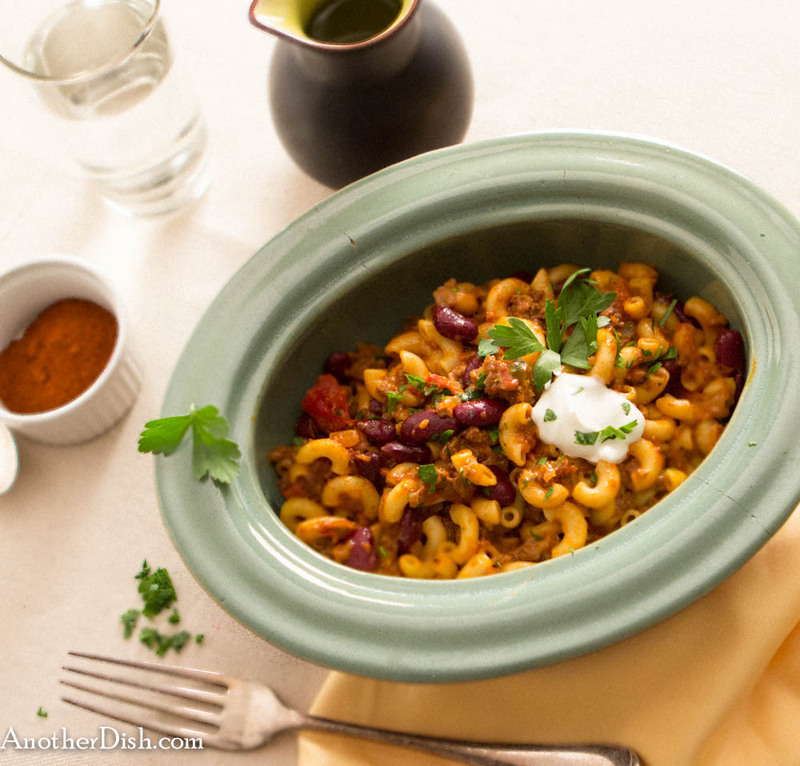 While searching on-line a while back for an “American Chop Suey” recipe (a classic New England comfort dish), I stumbled upon this recipe for “Chili Mac.” I didn’t search any further, and ended up trying this — it is delicious! I highly recommend using New Mexico chili powder, as it has much more flavor than grocery store chili powder (thus, “New Mexico Chili Mac” — I believe Texas is the true origin of this dish!). Heat olive oil over medium-high heat in a Dutch oven. Add onions and jalapenos, salt, and saute until onions are translucent, about 2 minutes. Add ground beef, chili powder, oregano and garlic, and stir, breaking up beef with the back of a wooden spoon, for 5 minutes. Add tomatoes, beans, and 1/2 cup water. Stir and bring to a boil. Reduce heat to low, and simmer until chili is thick, about 20 minutes. Cook macaroni according to package instructions. Combine 1/3 of the shredded cheese with the chili and cooked macaroni in a bowl, then pour chili mixture into a 9 x 13.5-inch casserole dish. Top with the remaining cheese, and place casserole in oven. Bake for about 10 minutes, until cheese is melted. Remove from oven and let cool for about 5 minutes. Garnish plated servings with a dollop of sour cream each. 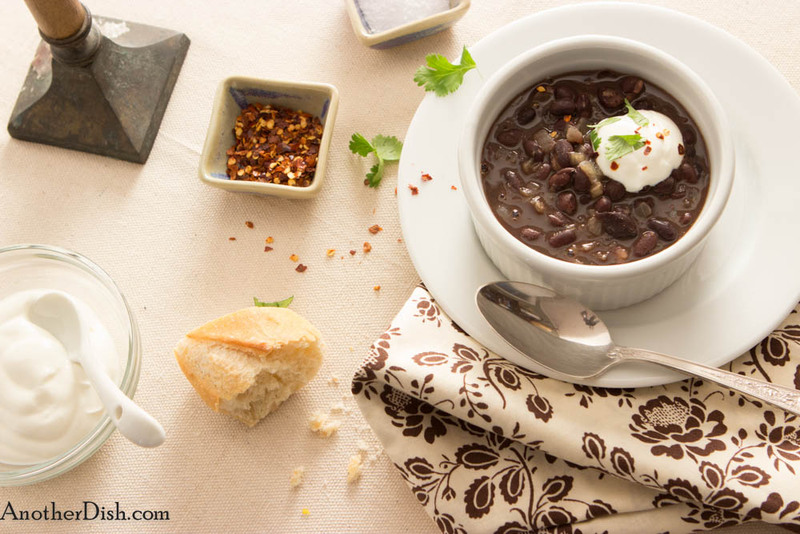 This entry was posted in Beef, Comfort Food, Pastas and Grains and tagged Beans, Chilies, Comfort Food, Cooking, Food, Foodie, New Mexico, Southwestern Food, Spicy on April 30, 2013 by AnotherDish. I don’t know how much salmon they eat (if any) in Southeast Asia, but Southeast Asian flavors sure go well with it! This is one of my favorite ways to make salmon, which I always have on-hand in the freezer (I like to buy the frozen, center-cut salmon filets, but it’s always a treat to prepare it fresh!). The salmon is coated in a wonderful coconut/panko/spice mixture, then pan seared. I especially like the sweetness of the sauce with this recipe, and the sour of the tamarind adds a nice balance. For the sauce, heat 1 tsp canola oil in a sauce pan over medium-high heat. Add onions, and saute for about 2 minutes. Add the ginger and garlic, and saute 1 minute. Stir in the tomato paste, and cook 1 minute. Add 1 cup hot water, tamarind concentrate, brown sugar and cayenne pepper. Stir and bring to a boil. Reduce heat to low, and simmer for 15 minutes. Remove from heat, and stir in the kecap manis and sesame oil. For the salmon, combine panko, coconut and turmeric in a shallow. Sprinkle the salmon with the salt, coriander and black pepper on all sides. Dredge the salmon filets in the panko mixture. Heat 2 tsp canola oil in a skillet over medium-high heat. Add the salmon to the skillet, and cook 3 minutes. Gently turn the filets over in the skillet, and cook an additional 3-4 minutes. Serve with steamed jasmine rice. This entry was posted in Indonesian, Main Dishes and tagged Cooking, Food, Foodie, Indonesian, Indonesian Food, Kecap Manis, Recipes, Salmon, Southeast Asian Food, Spicy on April 28, 2013 by AnotherDish. This is another simple soup that I make at any time of the year. It’s a fusion of Caribbean and South Western (U.S.) flavors (because I love both! ), which I think go together pretty well. I hope you’ll try it and let me know what you think! Heat olive oil in a medium sauce pan over medium-high heat. Add the onion and garlic, and sauté until onions are translucent (about 3 minutes). Add the coriander, cumin, oregano, and cayenne pepper. Sauté for another minute. Add the beans, chicken broth, bay leaf, brown sugar, salt, black pepper and vinegar. Bring to a boil, and then reduce heat to low. Simmer uncovered, stirring occasionally, for about 20 minutes. Remove bay leaf. Season with additional salt and pepper, if desired. Serve with crusty French bread. Add a dollop of sour cream and some cilantro and red pepper flakes on top of each serving. This entry was posted in Beans, Comfort Food, Main Dishes, Soup and tagged Beans, Comfort Food, Cooking, Food, Foodie, Recipes, Spicy on April 20, 2013 by AnotherDish. When I have the time, I love to make Thai curry from scratch (which includes grinding my own chili paste in a mortar and pestle, etc.). When I don’t have the time, but am in the mood for Thai curry, I make this version. It’s quick and easy to prepare, and almost as good as the traditional version. Give it a try! 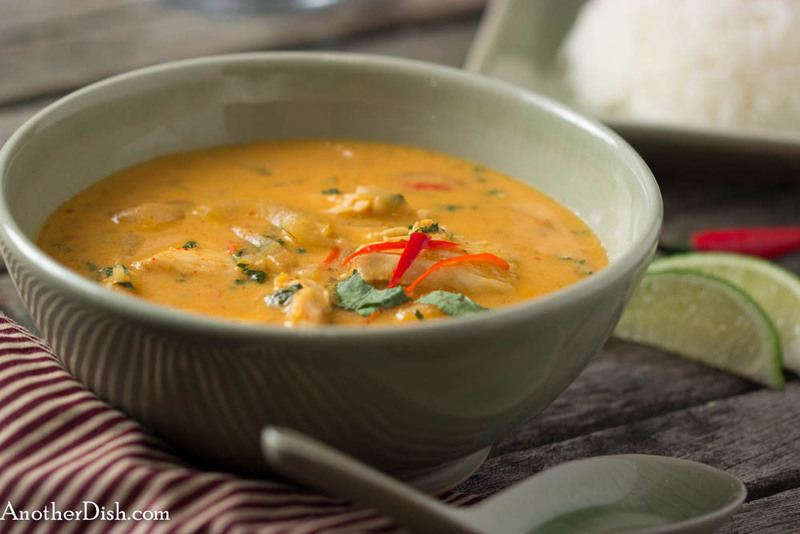 Heat 1/4 cup of the coconut milk and curry paste in a wok or Dutch oven over medium-high heat, stirring constantly. When the mixture has reached a boil, add the chilies and onion, and saute for 5 minutes. Add the chicken, sugar, fish sauce, salt and lime leaves and the rest of the coconut milk to the wok. Bring to a boil and cook for another 5 minutes. Add the basil and lime juice, and simmer for an additional minute. Serve hot with steamed jasmine rice. This entry was posted in Chicken, Main Dishes, Thai and tagged Cooking, Curry, Food, Foodie, Recipes, Spicy, Thai, Thai Food on April 14, 2013 by AnotherDish. 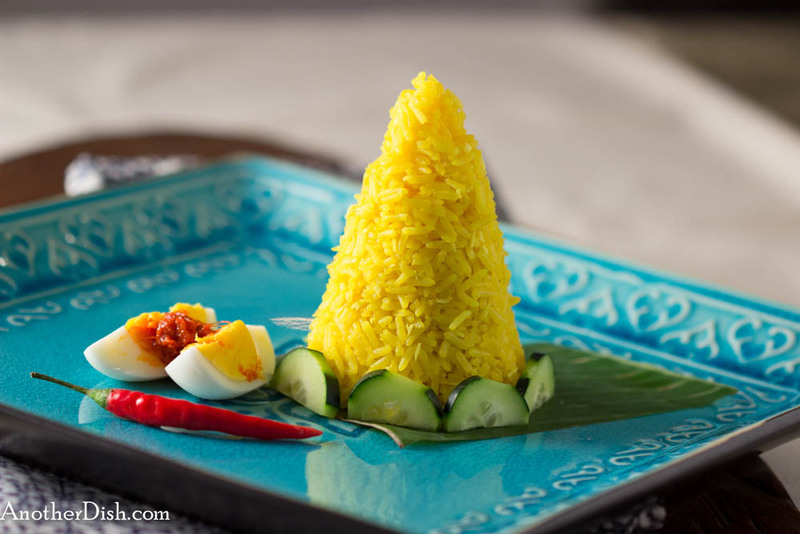 Nasi kuning literally means “yellow rice” in Indonesian. On special occasions, it is served in the shape of a cone, or tumpeng, and some of my research indicates that this is a representation of the mountains of Indonesia. 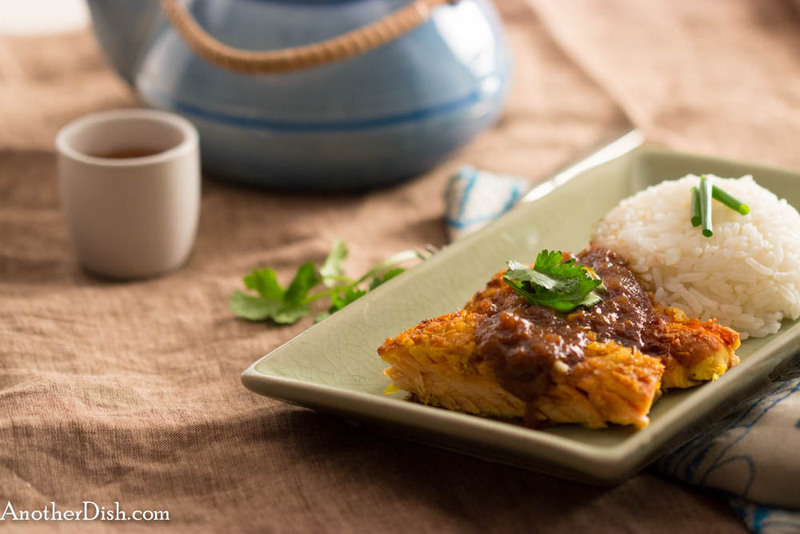 It has a wonderful, aromatic flavor, and I love to serve it as an accompaniment to a variety of Indonesian meals (and not just on special occasions). The method I use to make it is not completely traditional, but I think it ends up tasting pretty authentic. Heat oil over medium heat. Add diced onions and saute until translucent, about 3 – 4 minutes. Combine rice, water, salt, shredded coconut, turmeric, coriander, salam leaves, garlic and the sautéed onions in a sauce pan. Bring to a boil. Stir well. Put the lid on and reduce the heat to very low. Simmer for 20 minutes. Remove from heat and fluff with a fork. Put the lid back on and let stand for 10 minutes before serving. This entry was posted in Indonesian, Pastas and Grains and tagged Cooking, Food, Foodie, Indonesian, Indonesian Food, Rice, Spicy on April 10, 2013 by AnotherDish. 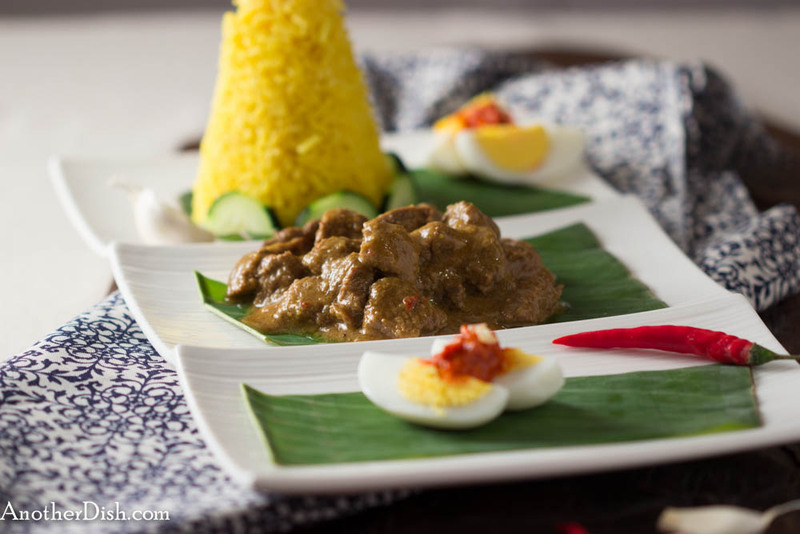 Gule Sapi is a spicy beef stew, simmered slowly in an aromatic coconut sauce. It’s called a “stew,” but it’s more like a curry, and I like to make it at any time of the year. It’s plenty spicy as is, but you can ratchet up the heat by leaving the seeds in the chilies (which is the way I like it), or you can tone down the heat by using less of the chilies and sambal ulek. This dish is delicious, so I hope you’ll try it! Add first 15 ingredients (through peanut/canola oil) to a food processor. Process to a fine paste and set aside. Heat 2 tsp peanut/canola in a Dutch oven over medium-high heat. Add beef and 1 tsp salt, and brown for 5 minutes. Leaving the juices in the pan, remove the meat and set aside. Reduce heat slightly. Add the paste mixture to the pan and gently saute for 5 minutes. Add the meat back to the pan. Add the water, cinnamon stick, salam leaves and lemongrass. Stir and bring to a boil. Cover the pan, and simmer on low heat for 40 minutes. Remove the lid, and add the coconut milk. Stir and bring to a boil. Simmer on low heat for about an hour, until the beef is tender, and the sauce is very thick. Remove the salam leaves, lemongrass and cinnamon stick. Serve with white coconut rice, or Indonesian yellow rice (nasi kuning), and any Indonesian relishes or pickled vegetables you have on hand. This entry was posted in Beef, Comfort Food, Indonesian and tagged Chilies, Comfort Food, Cooking, Food, Foodie, Indonesian, Indonesian Food, Recipes, Spicy on April 7, 2013 by AnotherDish. I believe that paprika is underrated in the U.S. — people seem to only use it for adding a finishing touch (of color) to casseroles and deviled eggs, but it has such a wonderful flavor when used as a key ingredient in a dish. I keep three varieties on hand: Sweet Hungarian Paprika, Hot Hungarian Paprika and Smoked Paprika from Spain. 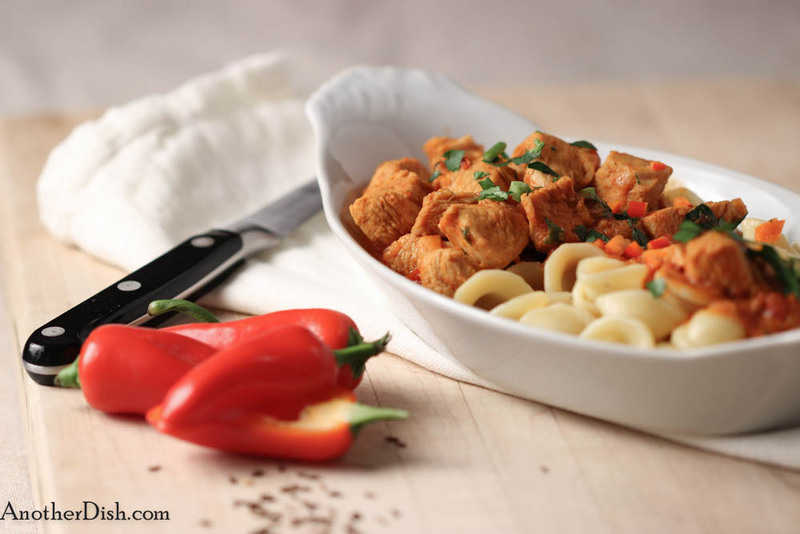 Chicken Paprikash is a dish that really shows off the Hungarian Paprika — I made this tonight (I make it regularly), and hope you’ll try it, as well. It is traditionally served with spaetzle, but I like to serve it with orecchiette pasta. In a medium bowl, combine the chicken with 2 Tbsp of the sweet paprika, 1 tsp of the hot paprika, the ground caraway seeds and 1 tsp salt. Melt the butter in a Dutch oven over medium heat. Add the onions, red bell peppers, remaining 1 Tbsp sweet paprika, remaining 1 tsp hot paprika and remaining 1 tsp salt. Saute for 4 minutes. Add the garlic and cook for 30 seconds. Turn heat up to medium-high. Add the chicken mixture, and saute for 4 minutes, until the chicken is no longer pink. Add the tomatoes and stock, and bring to a boil. Cover and reduce the heat to low. Simmer for 25 minutes. Uncover, add the sour cream and cook gently for about 2 minutes. Season with a bit more salt, if desired. Serve with orecchiette. This entry was posted in Chicken, Hungarian, Main Dishes, Pastas and Grains and tagged Comfort Food, Cooking, Food, Foodie, Hungarian Food, paprika, Recipes on April 1, 2013 by AnotherDish.